Why Would A Fish Make Its Own Sunscreen? : Shots - Health News Research suggests that genes that make a natural sunscreen jumped from algae to an ancestor of vertebrates hundreds of millions of years ago. Some animals kept the ability. Others didn't. The lowly zebra fish can make its own sunscreen. Scientists at Oregon State University say they've found that zebra fish, a popular species for lab work, can produce gadusol on their own. Until now, many thought fish got the stuff by eating bacteria and algae that made it. But why would fish make gadusol? "We know that gadusol has anti-UV properties, sunscreen properties," says Taifo Mahmud, a medicinal chemist at Oregon State's pharmacy school. Still, he says it's not entirely clear if animals such as zebra fish would make it for reasons other than UV protection. It's possible that gadusol, an antioxidant, might have other uses. In zebra fish, gadusol is produced in significant quantities during the development of embryos. 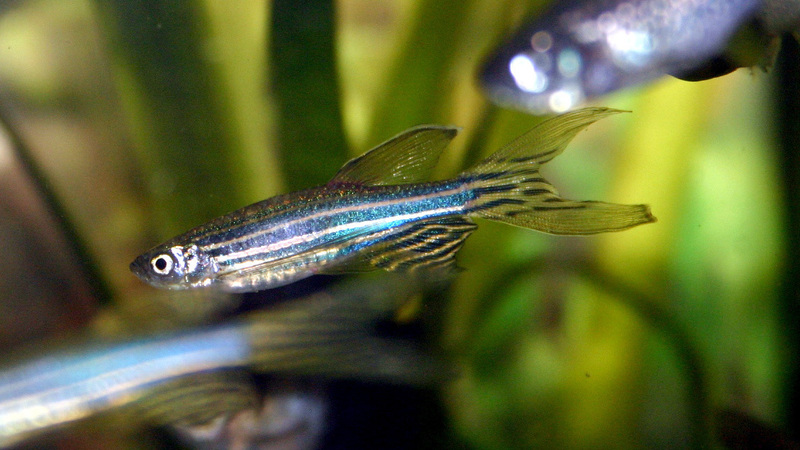 Mahmud's team found that the genes zebra fish use to make gadusol are different from the ones that microbes use. After searching the genomes of many different animals, Mahmud's team identified gadusol-producing genes like the zebra fish's in amphibians, reptiles and birds. They didn't find them in mammals or coelacanths, the ancient fish that were only known as fossils before they were discovered alive in 1938. The group's findings, published Tuesday in the journal eLife, suggest that the genes (called EEVS and MT-Ox) were carried by a common animal ancestor hundreds of millions of years ago that some later creatures, such as zebra fish, preserved while others did not. Where did the genes come from? Well, they look more like those found in algae than bacteria. So the Oregon State group's paper suggest that there may have been a jump of the genes from algae to the common animal ancestor way back when. These so-called horizontal transfers are common in lower organisms and may account for quite a few genes in the human genome, too. "Overall, this work illuminates a novel pathway that constructs an important biological sunscreen, but it also raises a number of questions," two Harvard chemists wrote in an accompanying analysis of the gadusol paper. How exactly did the cluster of genes evolve in animals and why did some lose them? And what biological purpose does the sunscreen chemical actually serve?